Never one to pass on a new way to promote a story, Amazon has in the past launched sections of the Kindle Store for serials, short-short works (Kindle Singles), and for enhanced ebooks, and a few weeks ago they added another section for stories that only take 15 minutes to a couple hours to read. The Short Reads section has not been announced by Amazon, but it went live in the Kindle Store some time in late March 2014. It was first noticed by authors on KBoards, and it contains stories which are anywhere from 1 to 100 pages in length, with prices between free and $1.99. It's not clear whether the new section has content that can't be found in other parts of the Kindle Store, but it does have a unique organizational scheme. The stories are broken up in to 6 sub-sections based on the estimated reading time (15/30/45/60/90/120 minutes). It's also not clear how many titles are available; based on the menu on the left there seems to be around 600,000 titles, all sorted by length. The ebooks are a mix of fiction and non-fiction. I don't think I saw any excerpts, but there were a number of stories that had previously been published in anthologies, magazines, etc. A few minutes browsing also showed me that Amazon is showing content from several of their publishing imprints, including Kindle Worlds, Story Front, Kindle Singles, and Day One Journal. 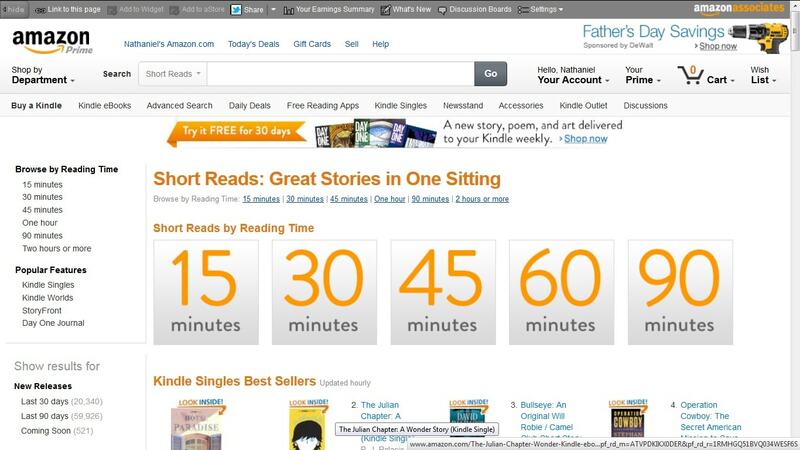 All of these imprints publish short works, and their presence here suggests that Amazon launched Short Reads in order to make it easier for readers who simply want a short piece to quickly browse all the short works Amazon sells on a single page. Starting with Kindle Singles (announced in January 2011), the 4 imprints were launched over the course of 3 years and cover a diverse selection of content. Kindle Worlds, for example, launched in June 2013 with a focus on licensed fiction. DayOne is a digital literary journal which launched in October 2013, and StoryFront launched in December 2013 as Amazon's fourth foray into short fiction. I suppose it’s good that they do this, but I hear over and over from readers that they don’t want a single short story–collections are preferred. Collections by a single author are generally preferred over a collection from multiple authors. Novellas are gaining in popularity after being sneered at for a while. This may be because readers can get an “extra” story about characters they love or “extra” time in a world/setting they love. I don’t really know, but they seem to be more popular than in the past. This is just my impression when I read various forums or when I have asked readers. It also shows up on GR by the number of people who read the “tweeners” –novellas that fit in-between the full novels. Mind, I’ve nothing against Amazon organizing or marketing short stories. Go them. But I’m not sure they can start a new trend with it. I’m a pretty avid reader and when they came out with Kindle Singles there wasn’t a thing –not one–that even tempted me and I looked a few times before wandering away, never to return. I do read short stories, but only genre ones–not lit, not famous authors I’ve never heard of. I do like novellas now and then, but they are pretty far down the purchase list. I only buy them IF I’ve already read the author. I don’t go out of my way to buy them. I do buy collections, but I do prefer them to be all the same author and preferably the same characters/world. Again, I think it’s great, but I wonder if there is a large enough audience for such a separate marketing effort. I like short works, both fiction and non, but I don’t like the prices Amazon charges – not when I can get full novels under 5 bucks, and not when I can get plenty of long articles for free online. Yup, me too. I’ll pay a couple of bucks for a collection, but I’d have to really, REALLY want to read a story to pay even 99 cents. I can read a short story in 15 minutes and while there are a number of them that I’ve found truly amusing…the ratio of good to bad is not enough to entice me to buy them. I will read short stories as part of a subscription if they are included in the price. So if I came across some on SCIBD for example, I’d happily read a few if they were in the genre I read. In that sense I’d be paying for them. But not ONLY them–they’re packaged with the deal. But, as I said, I wish them luck. I’m sure there is at least a niche market for it. I won’t read serials either. I generally don’t even like serials that are put out as one volume at the “end” because sometimes the story still reads like a serial. I just avoid them. But there’s probably a niche market for them too. Exactly. The whole price-value ratio is also why I never got into comics. I could never force myself to pay $3 to $4 for only a fraction of a story. One of my books got into this category somehow after enough sales a few weeks back. I emailed Amazon on what other keywords or categories I could use to get in there, but I didn’t hear back from them. I’ve got 5 Kindle Worlds books. They don’t sell well, and the reporting leaves much to be desired. Others do pretty well, however. I guess it depends on your world, perhaps. I find a lot of these offshoots of Amazon aren’t managed all that well. For instance, with the G.I. Joe KW the cover designs are supplied and most authors think they’re rubbish. They won’t even give you the upload option, which I think just hurts sales. Hopefully these offshoots can really pack a punch for authors in another year or so. The authors over on KBoards can’t figure out the selection criteria either. I think this is a great idea. Whether or not they can run with it is another question entirely. There is a market out there for short stories. You can read a short story on a bus ride to work. You can read a short story before you go to bed. You can read a short story in the doctor’s office. Heck, you can even read a short story while sitting on the throne. There are readers of all shapes and sizes out there. Some folks are looking for t-bone books while others are hungry for a cheeseburger read. Short stories are the potato chips and candy of the e-book world. They taste great without filling you up. There is very little commitment involved. Reading a short story is a little like speed-dating. You like that story you might want to hunt up a novel and take it out to dinner and maybe even get lucky with it if you play your cards right. I write short stories because I like to read short stories – and you should ALWAYS write what you like to read. Which is why I will most likely NEVER write a parlor mystery. I love reading, writing, and reviewing short stories and Kindle Singles. Anthologies are especially appealing since you can get a variety of authors and voices in one book. May is officially Short Story Month! I think this is a good move by Amazon. When you upload a book, Amazon’s system scans it for a whole bunch of reasons, one of those being estimating page length. I guess they figure out the reading time from that. Then any e-book which fits in the 15 mins / 30 mins / 45 mins etc. categories gets automatically added to them. I suspect the order in which books appear (aside from the highlighted selections) are based on Popularity List ranking. Funny, that linked worked before. Thanks!